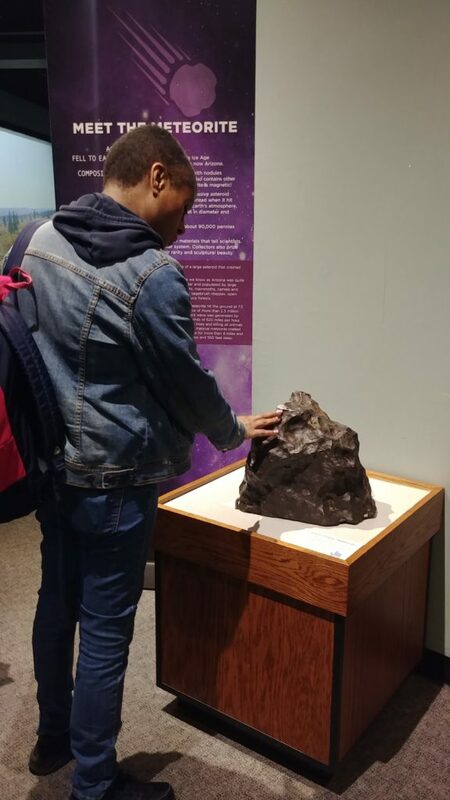 The Academy’s famous 4.54-billion-year-old Canyon Diablo meteorite recently lifted off from the third-floor hall outside of Outside In and landed downstairs inside North American Hall. This 498-pound hunk from outer space has a brand-new home and display panel crammed with interesting facts about the magnificent (and very heavy) rock. A meteorite is a small hunk of space rock that has broken off from a larger hunk of space rock. It earns the name meteorite after surviving the trip through outer space and the Earth’s atmosphere long enough to make impact with our planet. Over 90 percent of meteorites are made of rock, but the rest are like the Canyon Diablo meteorite, which is made up of iron and nickel. “The meteorite is part of the William Vaux Collection which was brought from Arizona in 1891,” said Ned Gilmore, the Academy’s collection manager for Vertebrate Paleontology, Mammalogy and Herpetology. The Academy owns the fourth largest piece of the meteorite in the world. The biggest chunk is on display by the Barringer Crater Company at the Arizona site of the Barringer Crater. “It was put on display in Outside In about 1994, then became part of the Academy’s Bicentennial Exhibition in 2012. Then moved back upstairs until now,” Gilmore said. 50,000 years ago, the meteorite plowed into the Arizona desert with the force of more than 100 atomic bombs, creating the most famous and best-preserved meteorite crater in the world, the Barringer Crater. The crater had an impact size of 160 feet in diameter; that’s over three times the size of an average school bus When the meteorite impacted Earth, it sent such a large shockwave across the desert that all the grass was ripped from the ground, trees were flattened, and all the nearby wildlife was killed. It is believed that about half of the bulk was vaporized during its descent through the atmosphere. 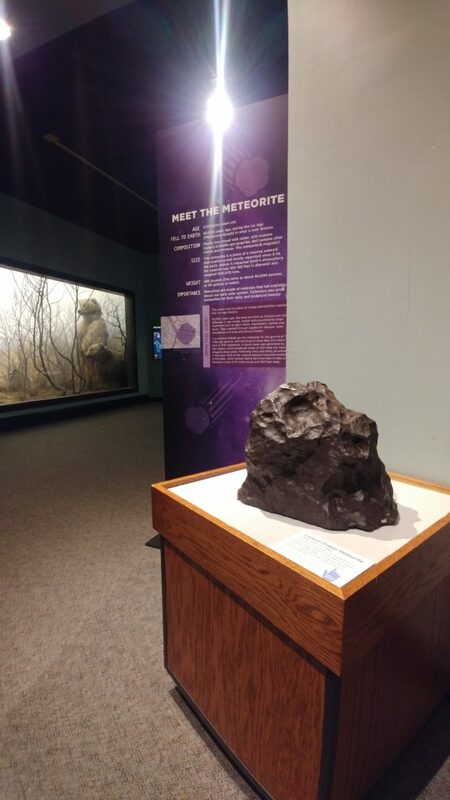 Jennifer Sontchi, senior director of exhibits and public spaces, said moving the meteorite to a more prominent space for visitors to appreciate made sense.